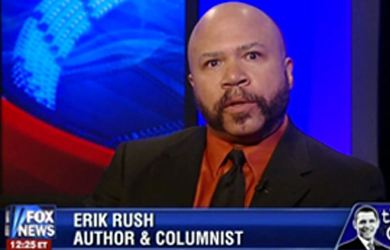 Conservative columnist and Fox News regular Erik Rush writes today that President Obama was trying to “stoke the embers of racial tension” when he cited racism as a reason that some people dislike him. 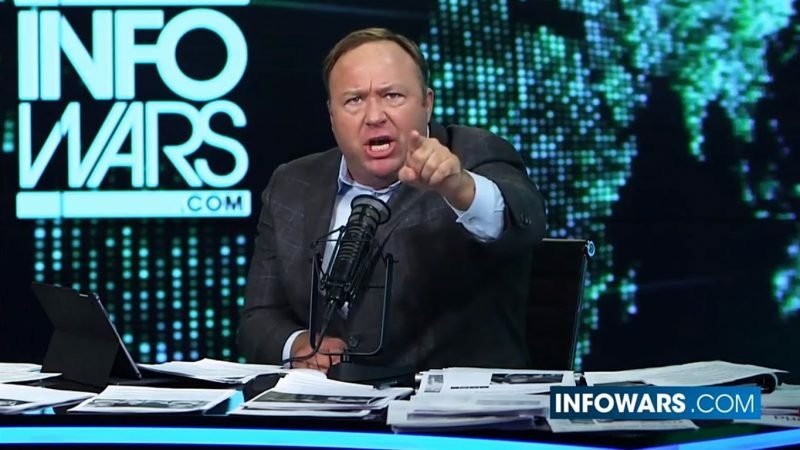 Rush urges conservatives to “sever” the “serpent that continually whispers poison into the ears of blacks,” and to buy his book Negrophilia. “Rest assured also that Obama, Attorney General Eric Holder (who has crafted racist policies within the DOJ and crusaded to make voter fraud an American institution) and other members of the black intelligentsia are magnificently titillated at the prospect of giving whites their ‘just due’ by enslaving and oppressing them as they tear the nation down,” Rush adds. The idea that racism has played a part in Americans’ dissatisfaction with Obama obviously defies logic. Did the whites who voted for him in 2008 and 2012 suddenly decide to embrace their “inner racist”? No. Of course, Obama knows that there is no logic in this whatsoever – but it doesn’t matter. He is playing to hopelessly propagandized blacks and leftist ideologues – the sorts of people who might vote in an outright communist as mayor of New York City, for example. Such statements as Obama’s also provide license to prominent race-baiting activists and his racialist surrogates (both black and white) to stoke the embers of racial tension – hence my statement regarding coordination. And well we should be doing everything we can to get that black man out of our White House – but it has nothing to do with his being black. It has to do with his being a subversive, a saboteur, an Islamist-enabler and a Marxist whose objectives are all focused upon destroying this nation as an ongoing economic concern, a world power and a functioning republic. I would like few things more than to see black Americans wake up en masse, realizing that they have been shamelessly whored-out by their leaders and progressive elites. Unfortunately (as I articulated in my book “Negrophilia: From Slave Block to Pedestal – America’s Racial Obsession”), I do not believe that this will occur until the serpent that continually whispers poison into the ears of blacks has its head severed. That serpent is the radical leftist machine in this country: Career civil rights activists, progressive politicians and the establishment press. While we have these factions purveying their dizzyingly infantile and baseless charges, the epsilons who hold their “blind allegiance to blackness” will continue to do so. Blacks will also continue to support our treasonous president – simply because he’s black. In the meantime, count on creatures like Wright, Barber, Jackson, Sharpton and hundreds of others to continue jabbering their so-called justifications for blacks’ pain in a never-ending, self-defeating cycle of imposed institutional mediocrity. Rest assured also that Obama, Attorney General Eric Holder (who has crafted racist policies within the DOJ and crusaded to make voter fraud an American institution) and other members of the black intelligentsia are magnificently titillated at the prospect of giving whites their “just due” by enslaving and oppressing them as they tear the nation down. Whites ought not take this too personally, though; enslavement is their plan for all of us.